« Going Green Means More Green Going? As I consider the vision of empowering a learning corporation, I break enterprise tools into 6 general areas. These areas provide a portion of what is required in order to survive and grow in an environment. These 6 areas are: Think, Communicate, Act, Know, Sense and Learn. They are in no particular order since the absence of any will prevent meaningful growth from occurring. I’ll be expanding on this concept over time, drilling into each area and the solutions we often use to meet that need. Depicted below is a very high-level diagram of these areas with the categories of products or functions I place in each. The categories are broad and I’ve chosen key terms to represent a lot of different tools and techniques. This framework provides an infrastructure, similar to how a person is made up of a set of systems. However, it is the information that is shared between systems that becomes the key to actually supporting the idea of a thinking and learning system. 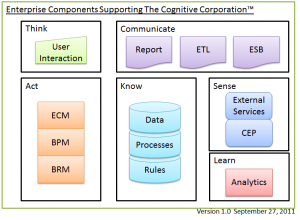 There are assumptions we make as we design enterprise systems that will limit our ability to empower a cognitive corporation™. For instance, we may limit our definition of valuable data to the information collected by our on-line systems. A broader interpretation begins to consider the process steps followed and the rules executed for a given interaction as data. There are many places where such assumptions and limitations will interfere with gaining a true advantage from our enterprise solutions. We must change our view of the way that a business benefits through the use of IT. The focus on feature sets for a specific type of problem must be replaced with a focus on the whole set of systems and how they interrelate and may be leveraged to benefit business growth – in multiple dimensions. This will allow us to make an order-of-magnitude jump in the value derived from IT investments. Therefore, an enterprise architecture goes beyond the role that systems will play, it must define how the systems will interact within the entire enterprise. 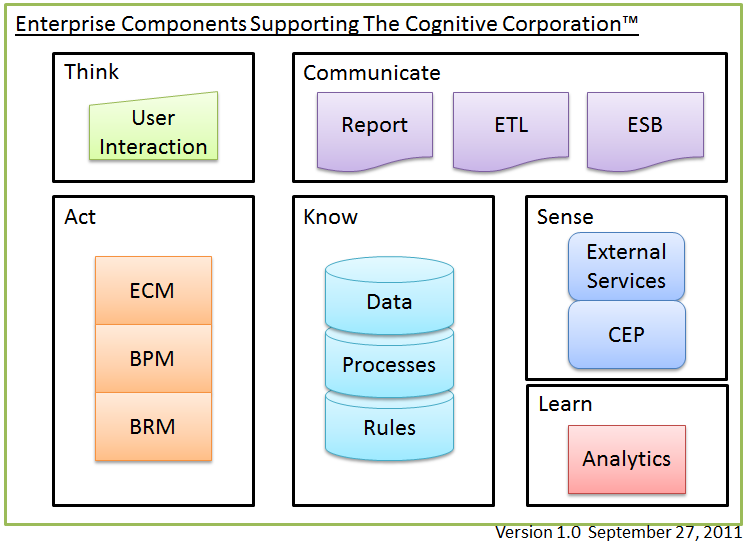 We are then in a position to leverage these powerful tools to create a cognitive corporation™. This entry was posted on Monday, September 26th, 2011 at 14:56	and is filed under Architecture, BPM, Cognitive Corporation, Information Systems, Tools and Applications. You can follow any responses to this entry through the RSS 2.0 feed. You can skip to the end and leave a response. Pinging is currently not allowed.